Happy Thursday! Now I know you might be thinking, it's too early for Christmas cards, but haven't you heard of the Christmas in July sales? This weeks Three Clover Challenge is Christmas in July, I used MMSC10 as the inspiration for my sketch this week. Yes, as you can see I got a little carried away with the layers, so this will not be one of the cards I'm sending this year, it would cost me a fortune to mail! The images are from Stampin' Up! 's Tree Trimming set, stamped in Red, Old Olive and Chocolate. 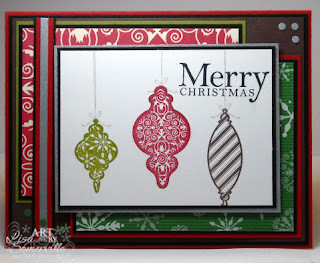 The beautiful DSP is Merry Moments one of the new Christmas papers from Stampin' Up! Thanks for stopping by. For more Christmas inspiration, be sure to click on the Three Clovers Logo on my sidebar to see what Kerry and the other Challenge Team members created. Awesome! Love the designer paper and the ornaments are very pretty! Very pretty Lisa. Those ornaments are so lovely and that DP is wonderful. I like the different layers you used. Dang, I bought about five Christmas sets and didn't get this one. This is a beauty!! Know what you mean on the postage, I just mailed four cards yesterday, two cost 64 cents and two cost 81 cents. I gotta make skinner cards! Great job! Very beautiful stamps! Love the DP, it goes so well with the ornaments! Gorgeous card, Lisa. Love the colors and those ornaments are so beautiful! Merry, merry Christmas!! What a beautiful and festive card. Such pretty ornaments. Thank you so much for playing with us at the MMSC this week!! What a beautiful Christmas card!! Love your ornaments and your use of the sketch!!! Great dp too. Thanks for playing with the MMSC this week! Lisa, I love the placement of the layout of this card. It is very nice! These ornament stamps make such a classy card! Great card! Fantastic Christmas Card in July! Love it! Thanks for playing with us this week. I can not wait to see what you make next week! Lovely Christmas in July card! Love the ornaments and the layering of colors. Great take on the sketch challenge! Thanks so much for playing along with us! Thank you so much for playing the Midnight Madness Sketch Challenge this week.